Home > Lighting > Chandeliers > CLEARANCE Metal Wire Pendant Hanging Lamp "Style C"
CLEARANCE Metal Wire Pendant Hanging Lamp "Style C"
Metal wire chandeliers are great for so many styles: Industrial, Vintage, Country Charm, Shabby Chic, Romantic and more. You'll love the distressed finished of the black/dark brown/rusted colors. The matching ceiling plate really brings the look together. 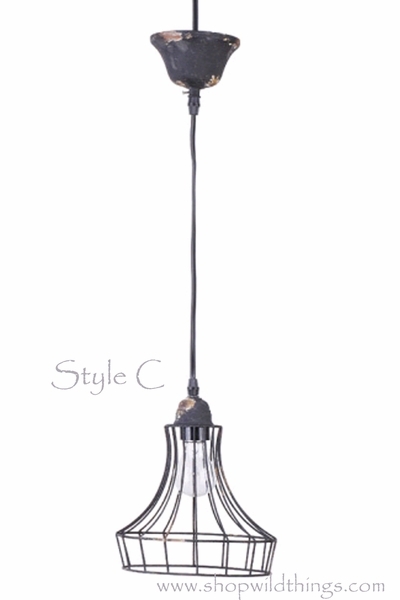 The "Style C" lamp is 11.25" tall and 8.5" in Diameter. There is a plug on the end of the cord, but you can also have an electrician (or handy-woman!) convert it to a hard-wire lamp easily. Uses one standard 40" light bulb.